Bosiljka is a female name, in Croatia principally Croatian, but also Serbian. It is one of the more common names (among the top 500) in Croatia, with over four thousand namesakes living there. The name Bosiljka was the most popular from years 1930 to 1937. The peak year was 1930. It was the least popular from years 1976 to 1986. Name Bosiljka is present mainly in North-West Croatia, and scarcely in Central Croatia. 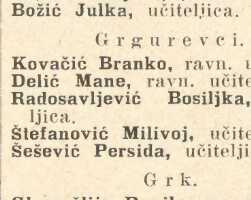 Most of the persons named Bosiljka live in the following cities and municipalities: Zagreb (over five hundred), Rijeka (over a hundred), Split (over a hundred). Relatively speaking, the city with the highest percentage of namesakes is Donji Kukuruzari (0.34% of total population). In the sources analysed in the project Acta Croatica so far, the name is mentioned over twenty times, the first time 1917 in source List of Dignitaries, Officials and Public Servants of the Kingdom of Croatia-Slavonia. If you want to preserve a family story or memory of a person with this name, or you want to know more about the name's origin and meaning Bosiljka.